When art actually succeeds at imitating life, it can be completely horrifying. This was made apparent at last night's (June 14) performance of monumental at the Hearn Generating Station in Toronto as part of the 2016 Luminato Festival. A collaboration between contemporary dance company the Holy Body Tattoo and post-rock legends Godspeed You! Black Emperor, the show explored themes of urban isolation, technology overkill, social discord and paranoia. The symbolism, both onstage and off, was evocative to the point of being unsettling, even gut-wrenching, as it forced the audience to confront some of our worst tendencies — both the ones we're aware of and newer ones we can just see growing. The Hearn Generating Station provided an even more perfect backdrop for the night than Luminato Festival organizers could have expected. A decommissioned coal power plant on a scale that has to be seen to believed — the 650,000 cubic metre space could fit 12 Parthenons — the Hearn is a towering relic of an older industrial age. Its cement floors and vast indoor space, sliced through with metal beams and broken machinery, were an unlikely but fitting setting for a makeshift theatre with thousands of perfectly lined chairs. The performance took questions of urbanization and gentrification — raised by the venue itself —further than anyone might have expected. 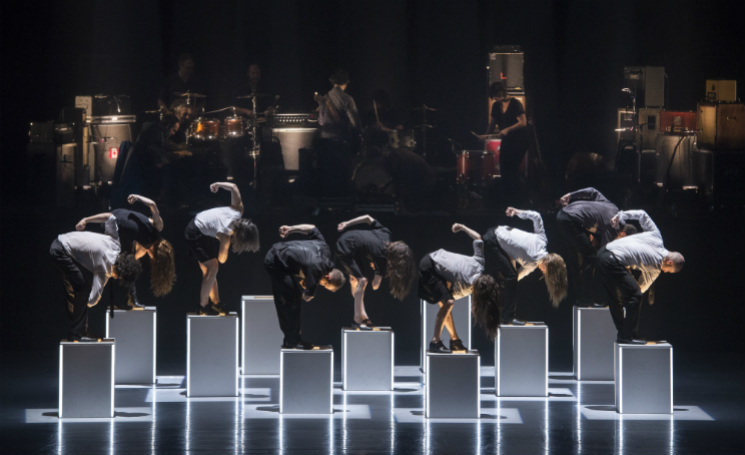 The dancers took the stage in typical "young urban professional" clothes and stood upon rectangular pedestals meant to resemble a city skyline. The disjointed, chaotic choreography evoked emotional flashes of a world experiencing life through its smartphones. As the show progressed, the dancers elegantly and terrifyingly teased out the themes of groupthink and isolated paranoia: their movements were either uniform to the point of being unsettling; when one dancer would break from the pack, the others expressed severe panic, often scratching at their bodies and hair as if suddenly covered in spiders. In the middle, there was chaos. On a handful of occasions, a peaceful moment gave way to fighting and rioting, before returning to uniformity. It was as if to say that, in an age when the internet dominates not only social interactions but provides the very fabric of society, we only have three states of being: rigid uniformity, utter chaos or complete isolation. The speed with which we move (and they moved) between the three is (was) all the more terrifying. The performance highlighted Godspeed's soundtracking abilities, an element that is ingrained in their aesthetic but rarely put to direct use. The necessities of performing with choreographed dancers meant the band had to rein in their improvisation and work with specific cues and compositions, and they shined even brighter than expected in this format, their music taking on extra urgency where it might otherwise spread its energy too thin. They tended heavily toward lush string arrangements, long feedback loops and dramatic swells — so dramatic, in fact, that many in the audience covered or plugged their ears from time to time. The show was a lot louder than a show at the National Ballet of Canada, and not everyone was ready for it. In essence, the music could have stood alone as a proper Godspeed album, which made it an extra treat for fans of the band that slogged through their long hiatus. The once-silent band are now in creation mode, and the ideas could barely be flowing more quickly. As the performance made clear, we need ideas from artists like Godspeed and the Holy Body Tattoo more than ever. The future holds inevitable change — the area around The Hearn will be gentrified, technology will only become more omnipresent in our lives, there will be a new U.S. president in November, and on, and on — and it's possible to reflect and choose the right path. monumental didn't provide any answers, but it did offer a terrifying glimpse of what's at stake.